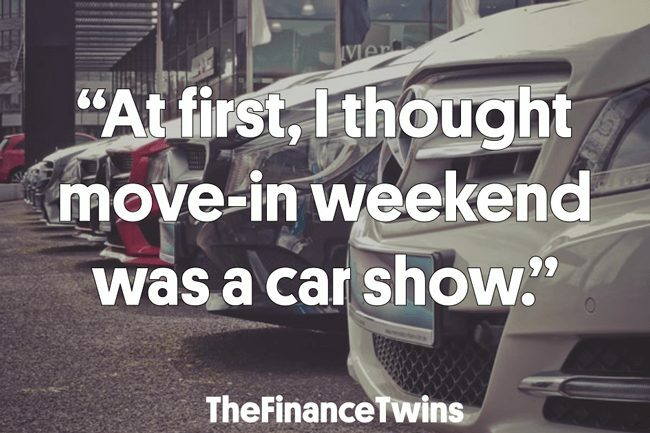 The Finance Twins is run by identical twins, Camilo and Francisco Maldonado. While The Twins collaboratively work on most articles, this one was written by Camilo. Being an identical twin, I got used to standing out a little more than the average person. An ordinary walk around the grocery store with my mom and siblings would often lead to strangers asking us if we were twins (duh, we are literally genetic clones) or simply pointing at us in amusement. On top of that, growing up in a relatively homogenous town in Minnesota as a Latinx immigrant, it was easy to feel different. But while it’s hard to think of things more isolating than growing up in poverty, one thing comes to mind. Being poor in the Ivy League and feeling like you are the only person there who didn’t come from a wealthy family. Note: Latinx is the gender neutral form of Latino/Latina. Graduating from Penn, an Ivy League university, changed the trajectory of my life. If it sounds like I am complaining about having had the opportunity — no, the blessing — to attend an Ivy League university, let me make a few things clear. No other single experience or community has more profoundly affected my life. It allowed me to go from being a Latinx immigrant, raised in poverty, in a single-parent household, to earning more than 6 figures in my first job out of college. My. First. Job. Even writing that feels silly to someone who grew with a household income that bounced around the poverty line. The fact that I was able to attend a university with a financial aid policy that said that students who come from families that earn less than $100,000 per year could attend for free is not lost on me. The thought that I received a degree that cost a quarter of a million dollars still gives me chills. The profound impact my college degree has made on my life has been nothing short of mind-numbing. I am one of the lucky ones. But it wasn’t all rainbows and sunshine, and I learned a few lessons about money along the way. 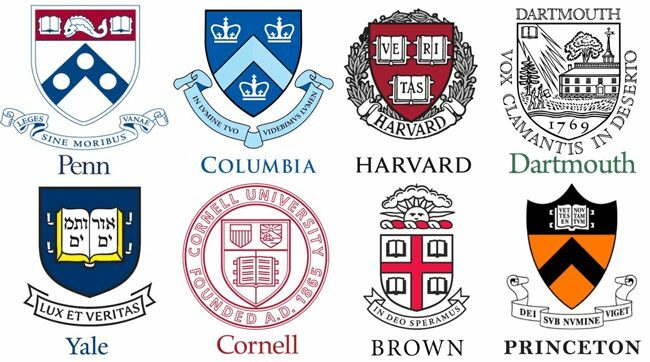 The eight universities in the Ivy League. But my time there wasn’t easy. The academics were the least of my worries. I shared a bedroom with Francisco, my twin brother and proud co-founder of this site, my entire life until I left home in Minnesota at eighteen years old to attend the Wharton School of Business at the University of Pennsylvania in Philadelphia. I arrived alone with my entire life packed into a single suitcase, because that was all I could afford to bring with me on the flight to the East Coast. Not having enough money to cover the taxi ride to Penn, I took public transit from the airport, which dropped me off a few blocks from campus. As I walked up to the outside of my dorm, the realization that most of the other students were being dropped off by their entire family hit me like a ton of bricks to the chest. I hadn’t even been in my adopted city for more than an hour, and I already missed the warm embrace of my mom and the comforting presence of my two brothers. I was embarrassed that no one was able to come and drop me off, and I was worried my new classmates might wonder whether I was loved by my family or not, even though I knew my mom and brothers would have given anything to be there with me. 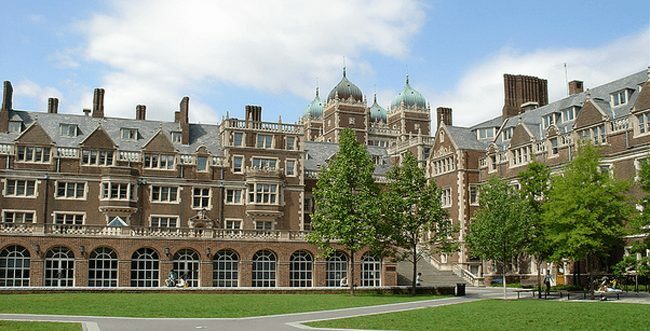 My dorm at UPenn freshman year. At first, I thought move-in weekend was a car show. I vividly remember wondering if the German automobile industry sponsored my university’s move-in weekend. The procession of proud parents entering to drop off their children for college seemed to indicate that you could only participate if you were driving a Mercedes, BMW, or Audi — cars that I was familiar with and had driven, since I had worked at a car dealership from the age of 15 — stuffed to the brim with mini refrigerators, televisions, bean bag chairs and other items that I definitely could not afford. Throughout the semester, I met the children of celebrities, hedge fund managers, and other titans of industry. I also met other students who came from backgrounds more similar to mine, and some who came from even rougher backgrounds than I did. Broken homes, victims of abuse, and even homelessness. But meeting people I could relate to was like finding a needle in a haystack while blindfolded. A row of Mercedes Benz, similar to what I saw on my move-in day. Birthday celebrations for my friends often included trips to restaurants off campus. But I never had the cash to spare for a meal that wasn’t included in the campus dining plan, so I always had to come up with an excuse for why I was unable to attend the birthday festivities. Being poor when surrounded by people who aren’t poor, ultimately forces you to come up with lies or excuses as to why you are too busy to join for costly outings. Mostly, out of fear that they won’t want to be friends if they know the truth. I also had a healthy dose of shame, as if it were my fault I was poor. Many of these special outings were trips to restaurants, and I wondered what it’d be like to try sushi or Indian food for the first time. Spring break often involved exotic trips abroad and winter break, trips to the Rockies to hit the slopes and rub elbows with the rich and famous. Something I had only ever seen in movies. But my school breaks consisted of going home to Minnesota and working. Am I hoping to get your sympathy? No, because I realize that many people currently face this reality. I had a credit card (which I opened on my eighteenth birthday in order to begin to establish credit) so I could always have said yes to my friends and lived beyond my non-existent means, but I was sick of being poor and wanted to do everything I could to try to change that. During that time, there wasn’t a single month where I carried a balance on my credit card. I was one of the lucky ones. … But I knew living beyond my means would only make things worse. I also could have borrowed thousands of dollars in student loans to give myself more breathing room, but it never felt like a good option since I knew I’d need any money I’d make after college available in case my mom or siblings had a financial emergency. I had seen creditors harass my mom, and I could think of nothing sweeter than to one day be able to tell them to stop calling because we had already paid. When my freshman roommate asked me why my mom never visited me at college, I told him that she just didn’t have the time to visit since she was constantly working. While that was true, since my mom really was always working around the clock, the real reason she never visited was that she just never had the money. So, instead, we were forced to speak on the phone to stay in touch. Today, we still talk on the phone daily, a ritual from not being able to see each other in those trying early college years. This taught me that distance and financial difficulties are not good enough excuses to let relationships fall by the wayside, but rather a reminder to foster those relationships and make them even stronger. It is those relationships that will buoy you during your darkest moments. My brothers and I finally bought her a plane ticket so she could see me graduate 4 years later. It was her first vacation in over a decade. Even though I had something in common with all of my classmates, I only seemed to notice the ways in which I was different. On the first day of classes, amongst all the guys wearing Sperry boat shoes and women sporting Longchamp bags and black leggings, I felt like I was the only student who didn’t have a trendy new outfit. Did I somehow miss the memo about the unofficial dress code? Surely, everyone else had coordinated their outfits. When you can’t afford those things, you become hyper-aware of everything you have, and even more aware of the things you don’t have. Today, it’s easy for me to take a step back and realize that comparing myself to others is the fastest path to misery, but as an eighteen-year-old thrust into a foreign place with peers who seemingly had it all figured out, it was basically impossible to avoid it. I was an outsider, and I knew it. I had been poor my entire life, but never felt as poor as when I was surrounded by people who seemingly never had to worry about money. I started college in 2007, the relatively early days of Facebook, so I can’t imagine what it must be like now, with Instagram being the museum of choice on which to display the rosy perfect life that no one actually has. But then I realized everyone struggles with their own problems. Even people who seem to have it all. While I felt like the rest of my classmates were lucky to have attended prestigious private high schools and boarding schools, I was surprised to see that they were also stressed about pending midterms, papers, and exams. Their lives weren’t as perfect or easy as I had thought. I think about the classmate who grew up in an exclusive Southern California community and would travel to and from school on the family’s private jet. He confided in me that he was having a hard time adjusting to college, the last thing I’d thought we’d have in common. It was during these years that I began to realize that no amount of money was going to give me sustained happiness. As I compared the happy childhood that I had with my brothers, to the stories I heard from my peers, of parents who were too wrapped up in their careers to give them attention, it dawned on me that the traditional definition of success might not be what I expected. It wasn’t easy losing my dad to cancer when I was only seven, and I still remember seeing all of the other dads on the sideline of the soccer field and wishing I had my dad there to cheer for me. But I will always be grateful that our mom showered us with love and attention whenever she was home with us, something that many of my classmates, and millions of people, sadly, cannot say. 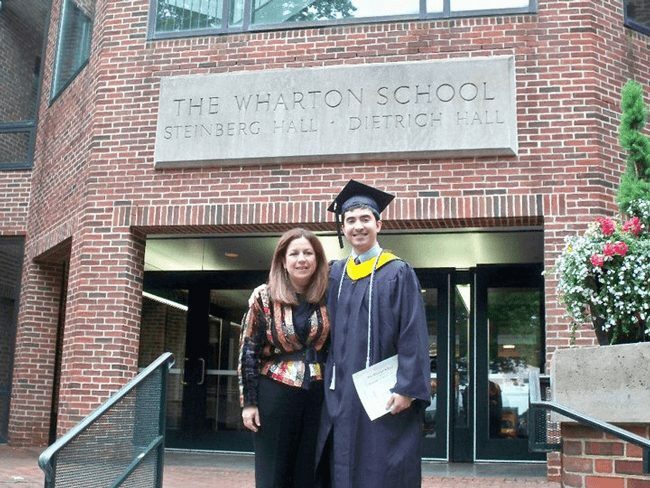 My proud mom and me on my graduation day from Wharton. Her first visit to campus. As I got ready to graduate, I was blinded by money. And I learned I already had the most important things. As graduation approached, I was lucky to have landed what was then my dream job of working in investment banking on Wall Street. Lured by the money, I had a general idea of what I’d be doing, but even more important to me at the time, I knew exactly how much I’d be getting paid. A LOT. Enough to help my mom pay some of her monthly bills and still be able to save. Naively, I thought I’d be making enough to never have to worry about money again, but New York City has a funny way of making even rich people feel broke. 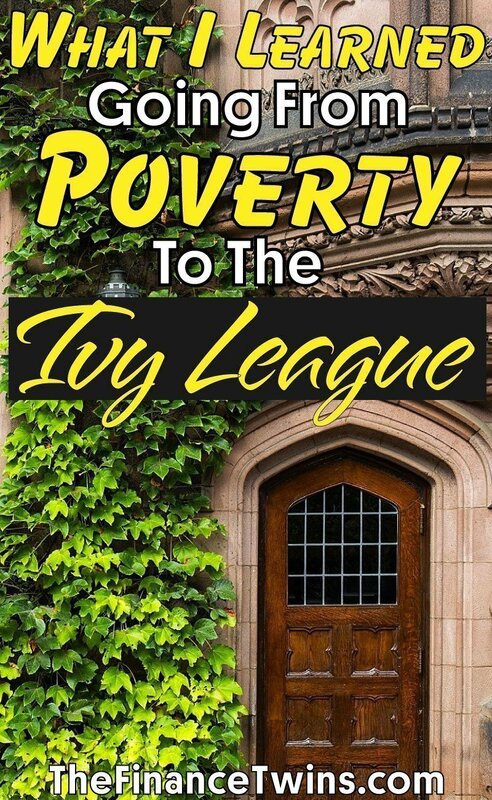 Now that several years have passed, I can look back and reflect on the way I struggled with the shame and embarrassment of being poor at an Ivy League university. Was the experience worth it? Definitely. Would I have done anything differently? Of course. For starters, I wish I would have known that I wasn’t alone and that I’d make an incredible group of friends. A diverse group who didn’t care from where or from whom I came. They simply judged me based on the content of my character and my ability to bring them joy, laughter and happiness. I wish I wasn’t embarrassed to say I couldn’t go out to dinner because I didn’t have the money. I wish I had had more faith in myself and more confidence that I deserved to be at this elite institution like the rest of my classmates. I wish I had known that I wasn’t the only one who struggled with this “imposter syndrome”. While I do wish I had this knowledge back then, I am proud of my experience. Whether it was luck, hard work, or a combination of both, I am proud that I was able to live within my means and graduate with only $5,000 in student loans, a fraction of the national average, thanks to generous financial aid. I am proud that I was able to leverage my undergraduate degree to work on Wall Street followed by an incredible fashion start-up. Subsequently attending Harvard for my M.B.A. was the cherry on top. My proudest college moment wasn’t graduating or getting my dream job. It was seeing my mom beaming with pride at my graduation — validation for the tremendous courage she had to raise three sons by herself in the U.S., when she could have retreated to Colombia, a familiar place surrounded by extended family. Yes, being a poor Latinx at an Ivy League university was isolating and may have felt embarrassing at times, but I now realize that I didn’t have anything to hide. With more confidence in myself and less fear about what others think, I’ll be able to continue to make the most of every opportunity. And so will you. Loved this post FT. I did not go to an Ivy, but I work with a lot of folks who did. I relate to feeling out of place, and frankly a bit awkward about how I fit in there. Thank you so much! Our story is also a story about resilience, which we know you have a lot of, too! We loved this post and could relate to much of it. We are both first-generation college students and went to elite universities where we had experiences that felt challenging and confusing. While we didn’t grow up in poverty, we grew up working class and did not have a ton of exposure to people who came from extreme wealth until we showed up at college. We can definitely relate to the “imposter” feeling that you mentioned. Colleges need more groups and clubs dedicated to low income and first generation students! Thank you for this post! It makes us so happy to to hear that you were both also able to overcome your circumstances! We can’t agree with you more. The more we talk openly about these experiences and feelings, the easier it’ll be for the next generation to seek help and guidance instead of just internalizing and trudging through. I have to admit, I got really emotional reading this post. I am a daughter of immigrants who grew up low/middle class, and I felt wildly out of place when I attended an Ivy for undergrad. We were lucky enough to be within driving distance, so my heart broke when I read how your mom didn’t even see your school until the day you graduated. It is amazing what parents will do for their children. College is a great time to be exposed to the real world and a bubble all at the same time. It sounds like you picked up some very valuable lessons that will carry forward. Thank you for not only taking the time to read and comment, but also sharing a bit of your story. It means a lot to hear from someone who can relate to that experience. Though I would have to say you were still better dressed then most Apollo people lol. Thanks for the continued education on these topics. Oh man, you’d be surprised at the things people would do to try to fit in. Buying clothes is the tip of the iceberg. Appreciate the truth and passion in this post! Thank you Derek! And thank you for taking the time to read! Really means a lot. I wasn’t privileged to attend an ivy league but the situation is much the same with my university in Nigeria. There are countless occasion whereby all my thinking and focus was finding ways to fit in. back in 2008, students were driving cares worth $40,000 and i can barely pay my tuition. Anyway thanks for sharing you experience and life lesson. Thanks awesome! You’re very welcome! Wow, Camilo. 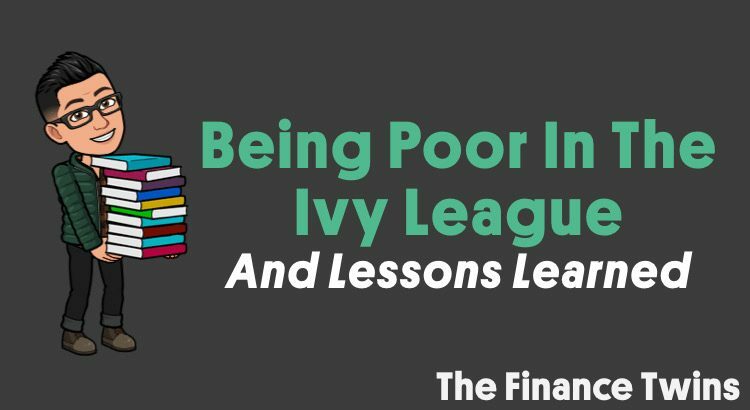 What an eye-opening account of your experiences in the Ivy League. I didn’t go to an Ivy League school, but I went to a ‘prestigious’ private university and I totally see where you’re coming from when you talk about the silent divide between the rich and the not rich. I’m impressed with your grit and I’m sure your family was SO proud to see you walking across that stage! Thank you so much for reading. I totally agree with you about the silent divide. Thank you for the kind words.